If you're diabetic or have dangerously high or low blood sugar, you could experience Diabetic coma. 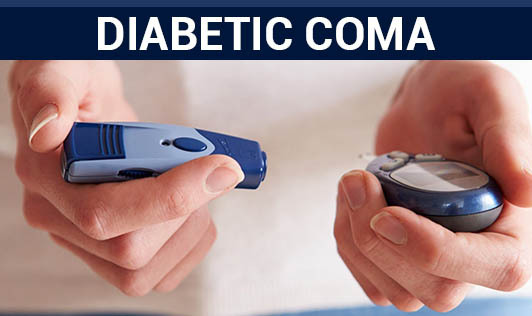 Diabetic coma is a life-threatening diabetes complication that causes unconsciousness. Hence, it is important to keep a check on your sugar levels. Diabetic Ketacidosis: When the muscle cells become starved for energy, one's body may respond by breaking down fat stores and this process forms toxic acids known as ketones. If left untreated, this can lead to diabetic coma. Diabetic Ketacidosis is common in people who have Type 1 diabetes but it can also affect people who have gestational or Type 2 diabetes. Diabetic Hyperosmolar Syndrome: If one's blood sugar level tops 600 milligrams per decilitre or 33.3 millimoles per litre, the condition is known as Diabetic Hyperosmolar Syndrome. This is most common in middle-aged or older adults who have Type 2 diabetes. Before developing diabetic coma, one may experience signs and symptoms of low or high blood sugar. • Eat healthy by following a meal plan that can help control your blood sugar levels. • Note that illness can elevate blood sugar unexpectedly; hence speak to your doctor on how to best manage irregular sugar fluctuations. • Take medications as directed. • Check for ketones when your blood sugar is high. • Keep an eye on your blood sugar level. • Use a continuous glucose monitor if you have trouble maintaining stable blood sugar levels. • Keep your loved ones informed. • Kick any unhealthy habits such as drinking and smoking. If you feel extreme low or high blood sugar symptoms, and you feel that you may pass out, seek medical assistance immediately!